How can children be trained to be faithful and efficient in their work for God? The blessing so earnestly sought by every Hebrew was denied this godly pair; their home was not gladdened by the voice of childhood; and the desire to perpetuate his name led the husband— as it had led many others—to contract a second marriage. But this step, prompted by a lack of faith in God, did not bring happiness. Sons and daughters were added to the household; but the joy and beauty of God's sacred institution had been marred and the peace of the family was broken. Peninnah, the new wife, was jealous and narrow-minded, and she bore herself with pride and insolence. To Hannah, hope seemed crushed and life a weary burden; yet she met the trial with uncomplaining meekness. Even amid the sacred festivities connected with the service of God the evil spirit that had cursed his home intruded. After presenting the thank offerings, all the family, according to the established custom, united in a solemn yet joyous feast. Upon these occasions Elkanah gave the mother of his children a portion for herself and for each of her sons and daughters; and in token of regard for Hannah, he gave her a double portion, signifying that his affection for her was the same as if she had had a son. Then the second wife, fired with jealousy, claimed the precedence [p. 570] as one highly favored of God, and taunted Hannah with her childless state as evidence of the Lord's displeasure. This was repeated from year to year, until Hannah could endure it no longer. Unable to hide her grief, she wept without restraint, and withdrew from the feast. Her husband vainly sought to comfort her. "Why weepest thou? and why eatest thou not? and why is thy heart grieved?" he said; "am I not better to thee than ten sons?" Hannah uttered no reproach. The burden which she could share with no earthly friend she cast upon God. Earnestly she pleaded that He would take away her reproach and grant her the precious gift of a son to nurture and train for Him. And she made a solemn vow that if her request were granted, she would dedicate her child to God, even from its birth. Hannah had drawn near to the entrance of the tabernacle, and in the anguish of her spirit she "prayed, . . . and wept sore.." Yet she communed with God in silence, uttering no sound. In those evil times such scenes of worship were rarely witnessed. Irreverent feasting and even drunkenness were not uncommon, even at the religious festivals; and Eli the high priest, observing Hannah, supposed that she was overcome with wine. Thinking to administer a deserved rebuke, he said sternly, "How long wilt thou be drunken? put away thy wine from thee." Hannah's prayer was granted; she received the gift for which she had so earnestly entreated. As she looked upon the child, she called him Samuel—"asked of God." As soon as the little one was old enough to be separated from his mother, she fulfilled her vow. She loved her child with all the devotion of a mother's heart; day by day, as she watched his expanding powers and listened to his childish prattle, her affections entwined about him [p. 571] more closely. He was her only son, the special gift of Heaven; but she had received him as a treasure consecrated to God, and she would not withhold from the Giver His own. Once more Hannah journeyed with her husband to Shiloh and presented to the priest, in the name of God, her precious gift, saying, "For this child I prayed; and the Lord hath given me my petition which I asked of Him: therefore also I have lent him to the Lord; as long as he liveth he shall be lent to the Lord." Eli was deeply impressed by the faith and devotion of this woman of Israel. Himself as overindulgent father, he was awed and humbled as he beheld this mother's great sacrifice in parting with her only child, that she might devote him to the service of God. He felt reproved for his own selfish love, and in humiliation and reverence he bowed before the Lord and worshiped. From Shiloh, Hannah quietly returned to her home at Ramah, leaving the child Samuel to be trained for service in the house of God, under the instruction of the high priest. From the earliest dawn of intellect she had taught her son to love and reverence God and to regard himself as the Lord's. By every familiar object surrounding him she had sought to lead his thoughts up to the Creator. When separated from her child, the faithful mother's solicitude did not cease. Every day he was the subject of her prayers. Every year she made, with her own hands, a robe of service for him; and as she went up with her husband to worship at Shiloh, she gave the child this reminder of her love. Every fiber of the little garment had been woven with a prayer that he might be pure, noble, and true. She did not ask for her son worldly greatness, but she earnestly pleaded that he might attain that greatness which Heaven values—that he might honor God and bless his fellow men. What a reward was Hannah's! and what an encouragement to faithfulness is her example! There are opportunities of inestimable worth, interests infinitely precious, committed to every mother. The humble round of duties which women have come to regard as a wearisome task should be looked upon as a grand and noble work. It is the mother's privilege to bless the world by her influence, and in doing this she will bring joy to her own heart. She may make straight paths for the feet of her children, through sunshine and shadow, to the glorious heights above. But it is only when she seeks, in her own life, to follow the teachings of Christ that the mother can hope to form the character of her children after the divine pattern. The world teems with corrupting influences. Fashion and custom exert a strong power over the young. If the mother fails in her duty to instruct, guide, and restrain, her children will naturally accept the evil, and [p. 573] turn from the good. Let every mother go often to her Saviour with the prayer, "Teach us, how shall we order the child, and what shall we do unto him?" Let her heed the instruction which God has given in His word, and wisdom will be given her as she shall have need. It was not customary for the Levites to enter upon their peculiar services until they were twenty-five years of age, but Samuel had been an exception to this rule. Every year saw more important trusts committed to him; and while he was yet a child, a linen ephod was placed upon him as a token of his consecration to the work of the sanctuary. 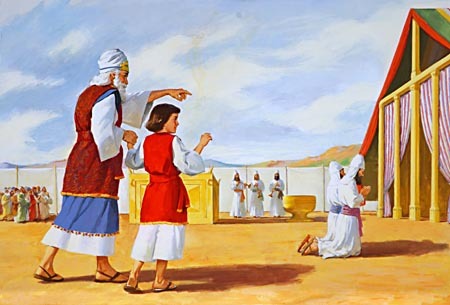 Young as he was when brought to minister in the tabernacle, Samuel had even then duties to perform in the service of God, according to his capacity. These were at first very humble, and not always pleasant; but they were performed to the best of his ability, and with a willing heart. His religion was carried into every duty of life. He regarded himself as God's servant, and his work as God's work. His efforts were accepted, because they were prompted by love to God and a sincere desire to do His will. It was thus that Samuel became a [p. 574] co-worker with the Lord of heaven and earth. And God fitted him to accomplish a great work for Israel. Success in this life, success in gaining the future life, depends upon a faithful, conscientious attention to the little things. Perfection is seen in the least, no less than in the greatest, of the works of God. The hand that hung the worlds in space is the hand that wrought with delicate skill the lilies of the field. And as God is perfect in His sphere, so we are to be perfect in ours. Thy symmetrical structure of a strong, beautiful character is built up by individual acts of duty. And faithfulness should characterize our life in the least as well as in the greatest of its details. Integrity in little things, the performance of little acts of fidelity and little deeds of kindness, will gladden the path of life; and when our work on earth is ended, it will be found that every one of the little duties faithfully performed has exerted an influence for good—an influence that can never perish. Click here to read the next chapter: "Eli and His Sons"